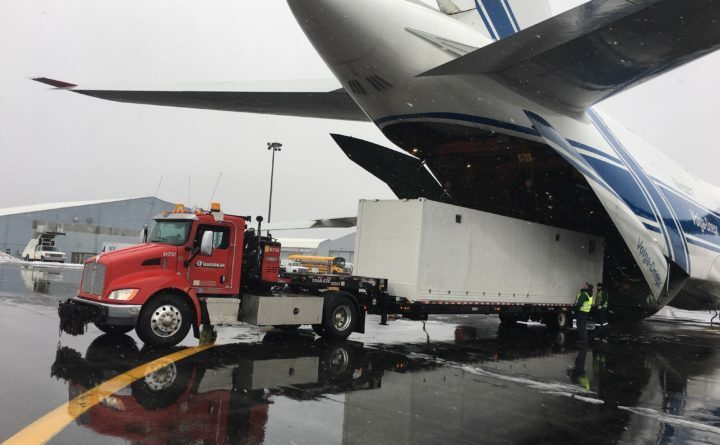 SnapSpace Solutions, a Brewer company that recycles used shipping containers into buildings, loaded two containers onto a jumbo jet at Bangor International Airport on Jan. 9. The containers are outfitted with bathrooms for schools in storm-ravaged Saipan, a U.S. territory hit by a powerful typhoon in October 2018. The company shipped two more container bathrooms from Bangor International to Saipan on Jan. 19. Two recycled shipping containers outfitted with restrooms were being loaded onto a jumbo jet at Bangor International Airport Saturday morning, destined for use at schools in the U.S. territory of Saipan. The Federal Emergency Management Agency hired SnapSpace Solutions Inc. of Brewer to build the restrooms for schools on the island, which was hit by super typhoon Yutu last October. The Category 5 typhoon, the worst storm to hit the United States since 1935, caused widespread damage to the Pacific Ocean island, which is the second-largest island in the Mariana Islands after Guam. SnapSpace Solutions of Brewer shipped repurposed shipping containers with built-in toilets and sinks to Saipan, a U.S. territory that was ravaged last October by the largest storm in the United States since 1935. The company shipped two bathroom containers via jumbo jet both on Jan. 9 and Jan. 19, 2019. Walton said the company has made two shipments of the 40-foot-long container restrooms to the Saipan schools, one on Jan. 9 and one on Jan. 19. The shipments also constituted a milestone for the company, Walton said, because they are the first FEMA contracts it attracted. The company builds customizable spaces for homes and work using recycled shipping containers made of steel that Walton said can withstand hurricanes. Its containers can have windows, doors and luxury built-ins. Walton said a tiny house could cost around $19,000, but higher end houses can go for several hundred thousand dollars. SnapSpace containers can be seen at the Waterfront Concerts in Bangor and the Maine State Pier in Portland venues including the ticket booths, VIP desk, commercial kitchen and margarita stands. Walton said the portable spaces, which can be assembled and disassembled using a crane, are suited to spaces like the concert venues. The Maine State Pier, for example, has taken down and reassembled the buildings seasonally. 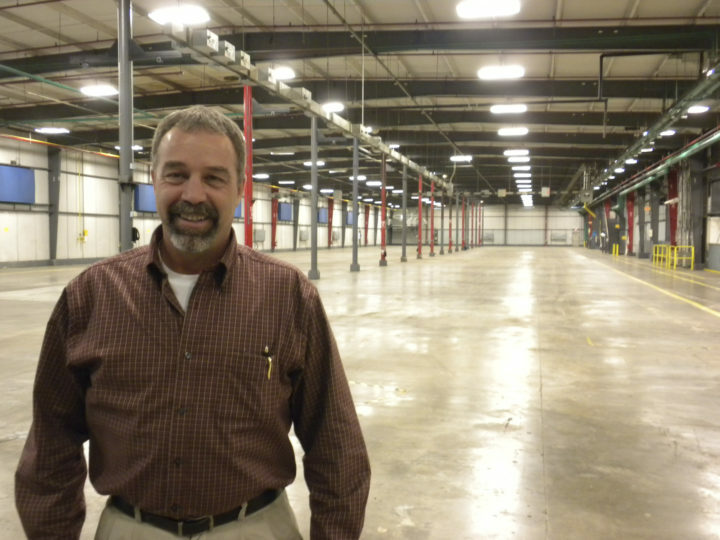 Chad Walton, CEO of SnapSpace Solutions, purchased the old Lemforder building in Brewer in 2011 to construct modular buildings. "It's quality, it's fast and they do snap together," he said in this 2011 file photo. "It's like Legos." The 7-year-old company is located in a 126,000-square-foot building at 55 Baker Blvd. Walton said there are about 60 employees, including full-time, part-time and subcontract workers. The company has outgrown its current location and plans to double the size of its manufacturing plant. It plans to recruit and train about 25 new full-time employees along with 50 new part-time employees and subcontractors. Walton would not give revenue numbers but said the company has grown 550 percent in recent years. Husson University is collaborating with the company. “I was introduced to Chad and his team early in 2018, by an investor from Florida, who wanted me to evaluate their growth potential,” said Brien Walton (no relation to Chad Walton), director of Husson University’s Center for Family Business and the CEO of Acadia Capital Management II Inc., a certified Community Development Entity that provides federal New Markets Tax Credits to investors in distressed communities and Opportunity Zones. “SnapSpace is a true success story,” Brien Walton said. “Their 550 percent increase in revenue for the 2018 fiscal year is nothing short of remarkable.